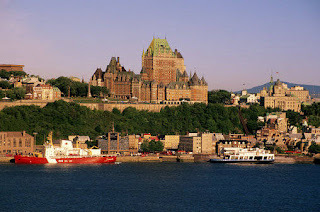 In just under 2 weeks, some of the largest investors in the world will converge on Quebec City, as part of an invite-only conference, appropriately called "The Quebec City Conference" (QCC). This is the kind of conference that we need more of, especially in Canada. There are enough demo days, startup drinks, and other forums for entrepreneurs to meet each other, and for entrepreneurs to meet investors. However, there is definitely a clear lack of places for investors to meet other investors and for GPs to meet LPs in Canada. The Quebec City Conference fills that void, and more importantly, brings the right people and money to Canada. For many years, I've been saying that the current Canadian venture capital ecosystem is fundamentally broken. There are many causes...too many to cover in just one post. And while many valiant efforts have been made to encourage more entrepreneurs and more startups, the money and returns simply haven't materialized as expected. Why is that? First, venture funds are still primarily financed by various government entities and public funds. Governments have completely different incentives, and often impose stifling measures on the venture funds that they finance. Relying solely on government sources of capital also makes the entire industry extremely vulnerable in the long term - not good if you're trying to create a sustainable ecosystem. Second, no venture funds have really taken any risks. No one has gone out and built a fund that does things differently in Canada. No one is thinking outside of the box. The kind of meetings that will take place at the QCC will hopefully help to attract and diversify the pools of capital that are available to canadian funds. And they will hopefully encourage conversations that will generate new ideas to turn the industry around. Getting investors together is necessary if we want to fix the broken VC ecosystem in Canada. Thanks fot this blog. Really enjoyed all the posts, hoping to get some more. By the way, how about the book project? Still in the freezer? Really liked the entire blog. Hoping there is more to come. By the way, is there is still a book project? Get this thing out of the freezer!